You may think you're looking at rabbits. But according to the United States Department of Agriculture (USDA), you're looking at chickens. And chickens, says the USDA, are not really animals. This isn't the first time the USDA has changed the meaning of commonly understood words. Perhaps you remember when the agency declared that ketchup was a vegetable. USDA officials have a well-established pattern of playing word games to avoid compliance with federal laws. And they're at it again. This time, they're doing it to avoid enforcing the federal Humane Slaughter Act—the law requiring animals to be rendered unconscious before they're butchered. Slaughter Act. Amazingly, the USDA has arbitrarily decided to classify rabbits as "poultry." This has resulted in nothing short of torture at the slaughterhouse. For some rabbits, this means having their throats sliced open, while they're fully conscious and struggling. For others, it means having their necks broken or being struck in the head with a metal pipe or a piece of wood. "The animals are completely aware of what's happening and are fighting for their lives." According to the USDA's own meat inspectors, some rabbits are fully conscious as they have meat hooks jabbed through their legs. Workers hang them up by "running a meat hook through a leg muscle" and "possibly through the bone. "Hung upside down, the rabbits then have their heads sawed off as they struggle and cry in pain. According to inspectors, workers "use a dull knife and have to keep using it over and over to decapitate the rabbit. The workers were having to try three or four times to remove the rabbit's head. There were occasions where the knife slipped and the rabbit's ears were cut off. "A worker had numerous scratches and bite marks from the rabbits struggling to survive as he was killing them," the inspectors continued. "The rabbits will cry almost like an infant with loud shrieking noises." Outraged by what they saw, some USDA inspectors contacted their supervisors. They were told that no action would be ' taken to stop these atrocities "because rabbits are classified as poultry by USDA and are therefore excluded from Humane Slaughter Act enforcement." Please contact the Secretary of Agriculture. Tell him that no farm animals should be slaughtered while still fully conscious. 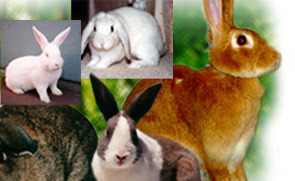 Ask that the USDA adopt regulations to include rabbits as well as chickens under the Humane Slaughter Act. Urge the Secretary to take immediate action to stop the kind of brutality that his own inspectors are witnessing.